Background: Streptococcus mutans is considered as the main pathogenic factor for initiation and progression of dental caries. Fluoride is one of the most effective agents used to control caries. Chlorhexidine (CHX) is the most antimicrobial agent against S. mutans and dental caries. Aims: The study aimed to compare the effectiveness of antimicrobial activity of CHX-thymol (CHX/T) and fluoride varnishes on S. mutans levels in children's saliva aged from 6 to 8 years old. Materials and Methods: The total number of children involved in this study is sixty, ages 6 and 8 years old. The participants were divided into three groups by block randomization: Group 1 CHX/T varnish, Group 2 fluoride varnish (f varnish, and Group 3 control group. Varnish was applied onto all tooth surfaces of the participants. At the baseline conditions, saliva samples were collected from the participants for bacterial examination test. This procedure was repeated in week 1, 4, and 12. Bacterial quantitative test was performed, and the number of S. mutans was estimated. Results: The results revealed the significant efficacy of the two groups (fluoride and CHX/T varnishes) in reducing salivary S. mutans numbers when compared to the control group (P < 0.05). In terms of salivary colony-forming unit counts reduction of S. mutans, no significant difference was observed between the fluoride and CHX/T varnish groups (P > 0.05). Conclusion: The outcomes showed that there was a significant reduction in S. mutans counts in children's saliva following the application of fluoride and CHX/T varnishes. Dental caries is a major oral health problem affecting 60%–90% of schoolchildren. It has a multifactorial etiology and developed on the presence of the dental biofilm, which is responsible for mediating the demineralization of dental hard tissue. These factors are cariogenic microorganisms, the fermentable substrate, and vulnerable host. Streptococcus mutans (SM) is considered the main pathogenic factor responsible for the initiation and progression of dental caries., Saliva is considered the primary protective system in the oral cavity; it contains many antimicrobial substances and helps neutralizing the acid and replenishing the ions that can remineralize the enamel. The prevention of dental caries should focus on the reduction of SM. Caries control might be beneficial for children who are at high risk of dental caries. Thymol has an antiseptic effect when added to CHX. In addition to having synergistic effects, there is also good absorption by the tooth, desensitizing effect, and excellent tolerance by the patients. In addition, some studies have concluded that fluoride inhibits colonization, metabolism, and growth of bacteria, as well as reducing acid production by some species, especially SM. Fluoride varnishes can adhere to the tooth for a longer time, preventing the immediate loss of fluoride after application. The reduction of caries by fluoride varnishes has been proven to be equivalent to fluoride solution and gels. The data available so far are not clear about the recolonization time of SM following CHX varnish and fluoride varnish treatment. Furthermore, the data for potency of the latter agents for 12-week posttreatment in children with high-risk caries are inadequate. 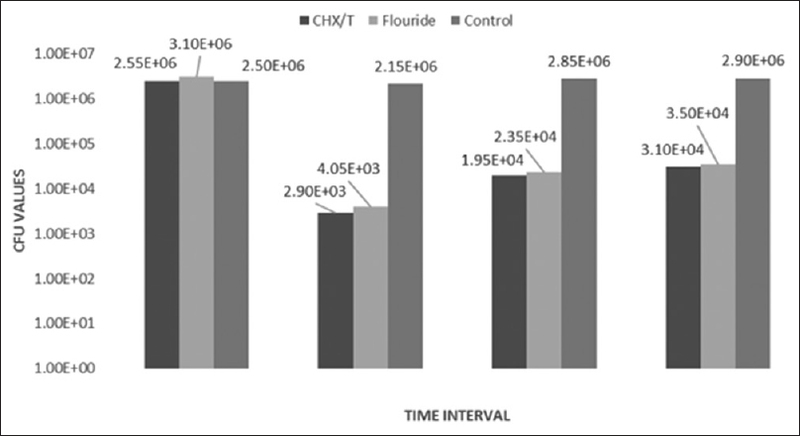 Thus, the aim of this study was to evaluate the antibacterial efficacy of CHX/thymol (CHX/T) and fluoride varnishes compared to a control group. The efficacy was measured by SM count in patient's saliva. Moreover, the potency of the used agents was also assessed for 12 weeks after receiving the treatment. This is a double-blind randomized controlled trial (the participants included in the experiment groups and the microbiologist assistant who interpreted the results were blinded about the study design and the treatment received). The trial was conducted to evaluate the effects of CHX/T and fluoride varnishes on salivary SM in children aged between 6 and 8 years old when compared to the control group. The patients were selected from Dar Al Rahma Association, at Damascus - Syria, the ethical approval was obtained from the Ethical Decision-making Committee, and the informed consent was obtained from children's parents or their legal guardians. Decayed, missing, and filled permanent teeth (DMFT) score between 0 and 1. Children with a history of fluoride or CHX treatment in the past 3 months. Group 3 (control group): consisting of twenty participants received nothing (at the end of this study, the protective varnish was applied for all children in the control group, all children were referred to faculty of dentistry to receive dental treatment). Before each varnish application, teeth surfaces were cleaned with cotton and gauze squares, dried with air syringe, and isolated with cotton rolls. A thin layer of varnishes (0.4 ml) was applied on all tooth surfaces using a suitable brush. The children were instructed not to eat, drink, or rinse their mouth for at least 1 h after this procedure and not to brush till the next morning. They were also asked to do normal oral hygiene procedures, and brush their teeth for 2 min, twice per a day, followed by flossing once a day, drinking water, and avoiding foods that are high in sugar or acid content. The child care assistants were asked to supervise children when brushing their teeth. Saliva samples were collected from the participants for bacterial examination test before application varnishes. This procedure was repeated on weeks 1, 4, and 12. The children were asked not to eat or drink 1 h before collection and not to do any physical exercise. They were also asked to sit comfortably, rinse mouth with water, and chew an enclosed paraffin pellet for a minute then the stimulated saliva was collected from their mouth in a suitable container. One milliliter of saliva was transferred to a labeled sterile test tube containing 9 ml of transport medium (normal saline) and immediately transported to the laboratory for processing. The saliva sample was serially diluted using sterile saline. About 0.1 ml of the suitable dilution was aseptically plated onto presolidified mitis salivarius agar with potassium tellurite. The plates were incubated for 48 h at 37°C in 10% CO2. After 48 h, the number of colony-forming units (CFUs) of SM (CFU/ml) of saliva was determined. Two independent microbiologist assistants (who were blinded about the study design and the treatment received) interpreted the result. Statistical analyses were performed by SPSS, version 20 (SPSS version 20, Inc, Chicago, USA). For intra- and inter-group testing, nonparametric tests were used. Kruskal–Wallis was performed for multiple intergroup comparisons at various time intervals. Intragroup comparisons between the baseline and other periods were assessed by the Friedman. Sixty children (32 males and 28 females) were selected for this study. The mean age was 7.27 years old. Mean DMFT and dmft in all groups were 0.61 and 4.65, respectively. Chi-square test revealed that, at baseline, there was no statistically significant difference between the groups with respect to gender [Table 1]. No significant difference was also observed in DMFT, dmft, and age at baseline [Table 2]. Since the bacterial growth did not have a normal distribution, the median index could better reflect the bacterial growth [Figure 1]. A Friedman test was also used to determine if there were differences in SM counts during a 12-week follow-up program in the varnishes groups. In both CHX/T and fluoride groups, SM counts were statistically significantly different at the different time points (baseline, 1 week, 4 weeks, and after 12 weeks; P < 0.0005). In control group, SM counts decreased from baseline (Mdn = 2.5000E + 006) to (Mdn = 2.1500E + 006) after 1 week, then increased after 4 weeks (Mdn = 2.8500E + 006) and after 12 weeks (Mdn = 2.9000E + 006), but the differences were not statistically significant, c2 (3) =5.606, P = 0.132 [Table 3]. Significant differences in SM count in fluoride group between baseline and 1 week (P < 0.0005), between baseline and 4 weeks (P < 0.0005), and between baseline and 12 weeks (P = 0.042). Kruskal–Wallis analysis was performed for intergroup comparisons at various time intervals, the difference between three groups was found to be statistically insignificant at baseline (P = 0.135). At week 1, week 4, and week 12, there was a statistically significant difference between three groups in each time [Table 4]. At week 12: Statistical significant differences in SM count between the CHX/T and Control group (P < 0.0005), and fluoride and control groups (P < 0.0005), but not between the CHX/T group and fluoride group (P = 1.000). The present study was designed to compare the antibacterial effect of CHX/T (Cervitec Plus) and fluoride varnishes (Fluor Protector) with the control group on the salivary SM in 6–8-year-old children after 1, 4, and 12 weeks of the varnishes application. In this study, saliva samples were used to determine the levels of SM because it is considered to be the potential good predictors of dental caries. SM induces mineral loss due to its strong adhesion to the tooth surface and acid production from fermentation of carbohydrates, which keep the local pH low. Therefore, reducing the levels of this microorganism in the oral cavity seems to be crucial for controlling dental caries. Children were selected from one association (Dar Al Rahma Association, at Damascus - Syria), to ensure comparable socioeconomic and feeding habits of all participants. In this study, we have used mitis salivarius agar to determine the level of SM in saliva, which is one of the best media was developed as a selective medium for culturing the SM. As a result of cationic composition of CHX, this drug can bind to hydroxyapatite, bacterial plaque, and mucous membranes. It can be gradually released, so it is effective in decreasing oral bacteria. Cervitec Plus has the advantages that it is far retained on the tooth for an extended time and also it can be applied on the interproximal and cervical areas and on teeth fissures. Ribeiro et al., 2008, evaluated the effect of different 1% CHX varnish regimens on the levels of mutants streptococci (MS) in saliva. They compared the application of 1% CHX varnish one time in a daily basis for 3 consecutive days and the application of 1% CHX three times with an interval of 4 days between each application. The authors concluded no significant difference in salivary levels of MS between the experimental groups in the different experimental periods. This study was also planned to evaluate the antibacterial effect of fluoride varnish on salivary SM. The result showed that there was a statistical significant decrease in mean CFU scores after 1 week, 4 weeks, and 12 weeks (P < 0.05). Fluoride varnish has been found to be an effective cariostatic agent in the field of pediatric dentistry. Fluoride ions make the tooth structure more resistant to acid degradation and can inhibit bacterial enzymes and change plaque ecosystem. These results agreed with the study performed by Castillo et al., 2001, who showed that sodium fluoride varnish released fluoride for 19 weeks after application on primary molars enamel stored in buffered calcium phosphate solution. Furthermore, Jeevarathan et al., 2007, found a statistical significant difference between the pre- and post-treatment bacterial plaque scores 24 h after fluoride varnish application. Hence, the reduction in bacterial counts could be due to the high concentration of fluoride released from Fluor Protector. The main finding of this study is that there is no statistically significant difference (P > 0.05) between the CHX/T and fluoride varnish groups in reducing the colony that forms units of SM. However, there is a statistically significant difference (P < 0.05) when compared with the control group. Similar results were observed in a clinical study carried out by Ekenbäck et al. They found that the treatment with Cervitec varnish caused a statistically significant reduction in SM at 1 week and 1 month comparison to baseline. No statistical significant difference over time was found, after treatment with the fluoride varnishes or the thymol varnish. However, these findings were not in agreement with the studies performed by Al-Jaradi et al. who found that fluoride varnishes groups had a statistically significant reduction in the salivary SM counts than the CHX varnish group. It was found that fluoride varnish was accepted well by most children; however, CHX varnish was less accepted by children, and this may be mainly due to the bitter taste of the varnish. The limitation of this study was short followup period for 12 weeks after varnish application, and the increase or decrease in SM count may or may not develop into actual caries lesion. A long-term study could give more reliable results. 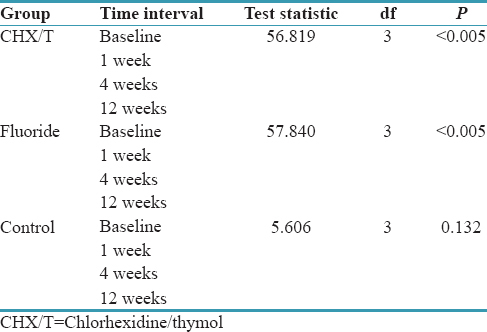 Within the circumstances of this study, it was concluded that both fluoride varnish (Fluor Protector) and CHX/T varnish (Cervitec Plus) application on teeth were equally effective in reducing SM count in saliva up to 12 weeks significantly. Further studies are needed to evaluate the long-term effectiveness of CHX and fluoride varnishes on the SM count in saliva. Petersen PE, Bourgeois D, Ogawa H, Estupinan-Day S, Ndiaye C. The global burden of oral diseases and risks to oral health. Bull World Health Organ 2005;83:661-9. Soames JV, Southam JC. Oral Pathology. 4th ed. New York: Oxford Medical Publications; 2005. Hardie JM. The microbiology of dental caries. Dent Update 1982;9:199-200, 202. Banas JA, Miller JD, Fuschino ME, Hazlett KR, Toyofuku W, Porter KA, et al. Evidence that accumulation of mutants in a biofilm reflects natural selection rather than stress-induced adaptive mutation. Appl Environ Microbiol 2007;73:357-61. Llena-Puy MC, Montañana-Llorens C, Forner-Navarro L. Cariogenic oral flora and its relation to dental caries. ASDC J Dent Child 2000;67:42-6, 9.
van Houte J. Role of micro-organisms in caries etiology. J Dent Res 1994;73:672-81. Sánchez-Pérez L, Acosta-Gío AE. Caries risk assessment from dental plaque and salivary Streptococcus mutans counts on two culture media. Arch Oral Biol 2001;46:49-55. Kulkarni VV, Damle SG. Comparative evaluation of efficacy of sodium fluoride, chlorhexidine and triclosan mouth rinses in reducing the mutans streptococci count in saliva: An in vivo study. J Indian Soc Pedod Prev Dent 2003;21:98-104. Pienihäkkinen K, Jokela J. Clinical outcomes of risk-based caries prevention in preschool-aged children. Community Dent Oral Epidemiol 2002;30:143-50. Attin R, Tuna A, Attin T, Brunner E, Noack MJ. Efficacy of differently concentrated chlorhexidine varnishes in decreasing mutans streptococci and lactobacilli counts. Arch Oral Biol 2003;48:503-9. Takeuchi Y, Guggenheim B, Filieri A, Baehni P. Effect of chlorhexidine/thymol and fluoride varnishes on dental biofilm formation in vitro. Eur J Oral Sci 2007;115:468-72. Emilson CG. Potential efficacy of chlorhexidine against mutans streptococci and human dental caries. J Dent Res 1994;73:682-91. Hamilton IR. Effects of fluoride on enzymatic regulation of bacterial carbohydrate metabolism. Caries Res 1977;11 Suppl 1:262-91. Bizhang M, Seemann R, Römhild G, Chun YH, Umland N, Lang H, et al. Effect of a 40% chlorhexidine varnish on demineralization of dentin surfaces in situ. Am J Dent 2007;20:193-7. George AM, Kalangi SK, Vasudevan M, Krishnaswamy NR. Chlorhexidine varnishes effectively inhibit porphyromonas gingivalis and Streptococcus mutans – An in vivo study. J Indian Soc Periodontol 2010;14:178-80. Pienihäkkinen K, Söderling E, Ostela I, Leskelä I, Tenovuo J. Comparison of the efficacy of 40% chlorhexidine varnish and 1% chlorhexidine-fluoride gel in decreasing the level of salivary mutans streptococci. Caries Res 1995;29:62-7. Evans JD, Martin SA. Effects of thymol on ruminal microorganisms. Curr Microbiol 2000;41:336-40. Trombetta D, Castelli F, Sarpietro MG, Venuti V, Cristani M, Daniele C, et al. Mechanisms of antibacterial action of three monoterpenes. Antimicrob Agents Chemother 2005;49:2474-8. Filoche SK, Soma K, Sissons CH. Antimicrobial effects of essential oils in combination with chlorhexidine digluconate. Oral Microbiol Immunol 2005;20:221-5. Tenuta LM, Cury JA. Fluoride: Its role in dentistry. Braz Oral Res 2010;24 Suppl 1:9-17. Pinar Erdem A, Sepet E, Kulekci G, Trosola SC, Guven Y. Effects of two fluoride varnishes and one fluoride/chlorhexidine varnish on Streptococcus mutans and Streptococcus sobrinus biofilm formation in vitro. Int J Med Sci 2012;9:129-36.
van der Hoeven JS, Franken HC. Effect of fluoride on growth and acid production by Streptococcus mutans in dental plaque. Infect Immun 1984;45:356-9. Van Loveren C. The antimicrobial action of fluoride and its role in caries inhibition. J Dent Res 1990;69:676-81. Beltrán-Aguilar ED, Goldstein JW, Lockwood SA. Fluoride varnishes. A review of their clinical use, cariostatic mechanism, efficacy and safety. J Am Dent Assoc 2000;131:589-96. Maciel SM, Marcenes W, Sheiham A. The relationship between sweetness preference, levels of salivary mutans streptococci and caries experience in brazilian pre-school children. Int J Paediatr Dent 2001;11:123-30. Petersson LG, Maki Y, Twetman S, Edwardsson S. Mutans streptococci in saliva and interdental spaces after topical applications of an antibacterial varnish in schoolchildren. Oral Microbiol Immunol 1991;6:284-7. Harris N, Garcia-Godoy F. Primary Preventive Dentistry: The Essentials. 5th ed. USA: Julie Levin Alexander; 2009. Araujo AM, Naspitz GM, Chelotti A, Cai S. Effect of cervitec on mutans streptococci in plaque and on caries formation on occlusal fissures of erupting permanent molars. Caries Res 2002;36:373-6. Ribeiro LG, Hashizume LN, Maltz M. Effect of different 1% chlorhexidine varnish regimens on mutans streptococci levels in saliva and dental biofilm. Am J Dent 2008;21:295-9. Horowitz HS, Ismail AI. Topical fluorides in caries prevention. In: Fejerskov O, Ekstrand J, Burt BA, editors. Fluorides in Dentistry. 2nd ed. Copenhagen: Munksgaard; 1996. p. 311-27. Castillo JL, Milgrom P, Kharasch E, Izutsu K, Fey M. Evaluation of fluoride release from commercially available fluoride varnishes. J Am Dent Assoc 2001;132:1389-92. Jeevarathan J, Deepti A, Muthu MS, Rathna Prabhu V, Chamundeeswari GS. Effect of fluoride varnish on Streptococcus mutans counts in plaque of caries-free children using dentocult SM strip mutans test: A randomized controlled triple blind study. J Indian Soc Pedod Prev Dent 2007;25:157-63. Ekenbäck SB, Linder LE, Lönnies H. Effect of four dental varnishes on the colonization of cariogenic bacteria on exposed sound root surfaces. Caries Res 2000;34:70-4. 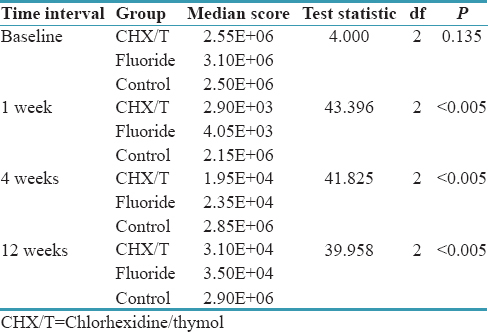 Al-Jaradi AM, Hamdy M, Ali W. Clinical evaluation of the antibacterial effect of fluoride and chlorhexidine varnishes. Egypt Dent J 2013;59:2489-501.